These codes are SERIES SPECIFIC. Which in short means, a Pokemon DARK EXPLORER Code can only be redeemed for a Pokemon DARK EXPLORER Online Booster Pack in the Pok�mon TCG Online shop. You will not be able to purchase this code and use it to unlock digital booster packs from any other expansion except the DARK EXPLORER Expansion. You are NOT purchasing actual physical card but the code delivered to you thru email which will give you a Pokemon Online Pack to access to play online. 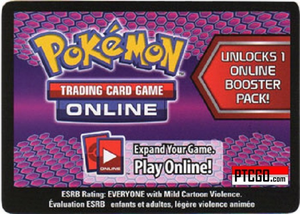 The code you are purchasing will unlock a pack of Pokemon DARK EXPLORER cards to your online account for play. Dark Explorers is the fifth expansion of cards from the English Black & White Series of the Pok�mon Trading Card Game. What's out there in the darkness, waiting to be discovered? Play the Pok�mon Trading Card Game: Black and White - Dark Explorers expansion and find them all! In addition to more Pok�mon-EX like Tornadus-EX, Raikou-EX, and Groudon-EX, the shadows are filled with other exceptional surprises, like Darkrai-EX and a host of Trainer cards that will knock your opponent's lights out! When you play Black & White - Dark Explorers, you'll not only explore the darkness, you'll rule it! This fifth Pok�mon TCG: Black & White expansion also continues an impressive run of featuring Unova and non-Unova region Pok�mon-EX cards, more powerful Pok�mon that deliver devastating attacks to your opponents. Darkrai-EX is joined by Tornadus-EX, Kyogre-EX, Raikou-EX, and Groudon-EX, all featured as Pok�mon-EX cards and rare Ultra full-art Pok�mon-EX cards! Very pleased with this product. The delivery via email was extremely fast. Definitely recommend these guys!